Various operations involved in preparing Brick-earth. Following are the various operations involved in preparing Brick-earth. If the area from where soil is to be taken is grassy or has other vegetation then the top layer (about 20 cm deep) is excavated and thrown away as it contains roots of vegetation and other organic matter. The excavated lumps of soil are broken. It is ensured that the soil is free from gravel, coarse sand, lime and kankar particles, vegetable matter etc. Excavated soil, after the clods have been broken, is mixed with a little water and is left in heaps to weather for a period varying from a few weeks to as long as it can be left. This improves its plasticity and strength. To keep the soil wet water may be sprayed on the heap from time to time and heap turned over. The earth is then thoroughly broken and mixed with sandy soil if needed. The whole mass is thoroughly mixed up and reasonable amount of water is added if needed. It is a conical iron tub of the shape and size shown in Fig. 2.1. In the centre of the tub there is a vertical iron shaft. To this shaft are fixed a number of horizontal arms with several vertical cutting blades attached to each arm. The mill is sunk 60 cm deep in earth and fixed on a pair of square timbers 20 cm x 20 cm. The central vertical iron shaft is rotated by bullocks yoked at the end of a horizontal arm the other end of which is fixed to the top of shaft. The mill could, however, be worked by using steam, diesel or electric power. Blended brick-earth along with the required quantity of water is fed in the mill from top. When the shaft rotates the cutting blades, fitted to horizontal arms, cut through the clay and break up all clods or lumps of clay. After the clay has been thoroughly pugged then it is taken out through an opening provided in the side near the bottom. 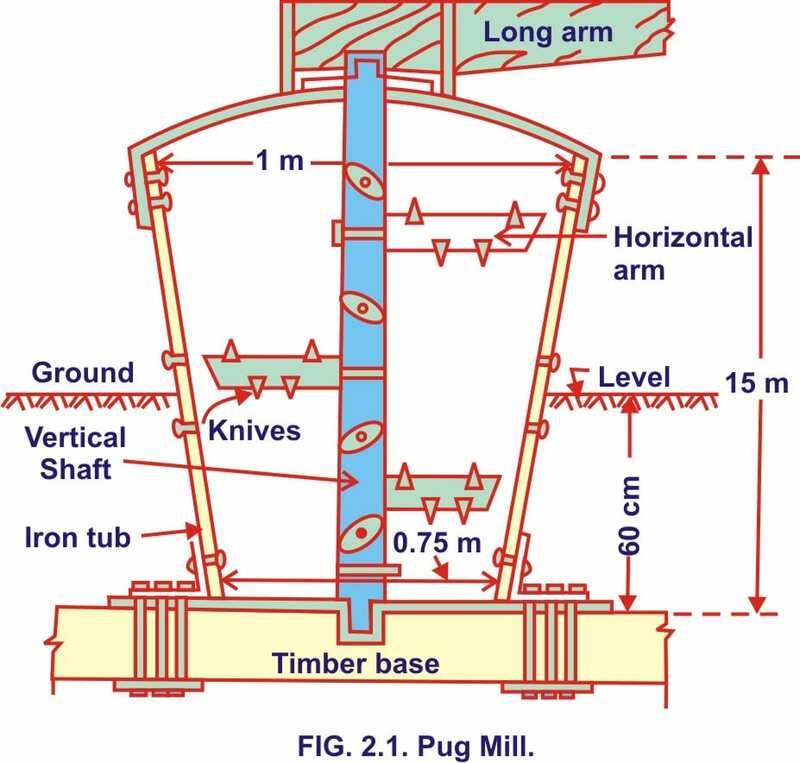 A pug mill of the size shown yields sufficient earth for a daily output of approximately[ 15,000 bricks. keep their shapes and last longer than the wooden moulds and are used for heavy works. These prove to be ultimately cheaper than the wooden moulds. Inside dimensions of the moulds are kept a little larger than the size of burnt brick (generally about 1/10th of the size of brick each way). It is done to allow for the shrinkage of the moulded brick on drying and burning. The exact allowance to be made for shrinkage can be ascertained by field tests.